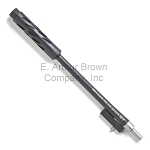 Ruger 10/22 Barrels - Custom Ruger 10/22 Barrels in 22LR replace your factory barrel. Accuracy and the Quality of Workmanship.. Both in our EABCO Accuracy Barrels® and in the many brands we carry! Tactical Solutions SB-X 10/22 Take Down Barrel w/Fake Suppressor-Threaded Barrel-Connecting Hardware Now Included!